Millennials came of age during a tough economic time: Student debt has reached an all-time high , and the job market is more competitive than ever. As a result, young people today aren't earning as much money as their parents did when they were young. So how much are they making? 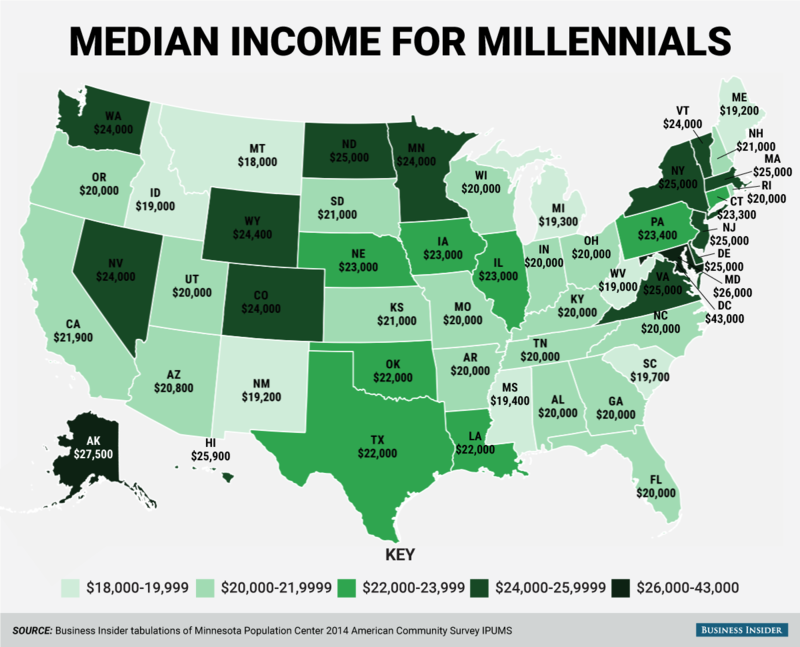 Using data from the Minnesota Population Center's 2014 American Community Survey in the Integrated Public Use Microdata Series, we found the median annual total personal income for employed millennials. We used the Pew Research Center's definition of millennials : Americans born between 1981 and 1997. The medians ranged from a low of $18,000 per year in Montana to a high of $43,000 in the District of Columbia. How do you stack up? Note that the youngest millennials are college-aged and may only be working part time, which may skew the median downward. Below, we included the median annual personal income by state for all employees over age 17, also from the American Community Survey.